What is Love? Love is God. 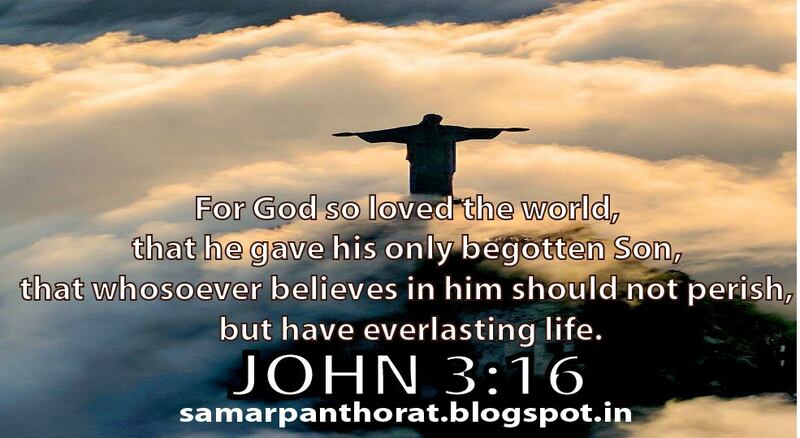 Heavenly Father Want everyone should come to Him and that is why He gave His Love, His only begotten Son to us. Heavenly Father doesn’t have many sons but He has only one Son and that Son He gave to this world. Why did He do this? Because of Love towards us. Love is everlasting, Love is never-ending. Love does not expect anything, Love is for everyone, Love is true and Love is not blind. Love has feelings. Love has senses, Love has power, and Love has strength. Only through Love God wants to draw each and everyone towards Him. Love is the highest form of giving. In this bible verse, it doesn’t say that I will Love or in the future, I will think and then decide to Love. No, but it says God so loved. Though we were a sinner, though we forget Him, though we didn’t know anything about Him, though we didn’t give respect to Him, from that time He has Loved us. Love is God because Love dwells in God. Love melts hearts, Love doesn’t argue, Love doesn’t hate, Love, don’t judge. Love doesn’t condemn. What do we understand by the word “SO”? So means big, it is uncountable, immeasurable. It is high above the sky. That much Love Heavenly Father has for us. If Father can give His Son to us, then He can give everything to us. He trusts us. He wants us. He loves us more than anyone in this world. I love you, Lord. Thank you for loving me. Help me to understand your Love. 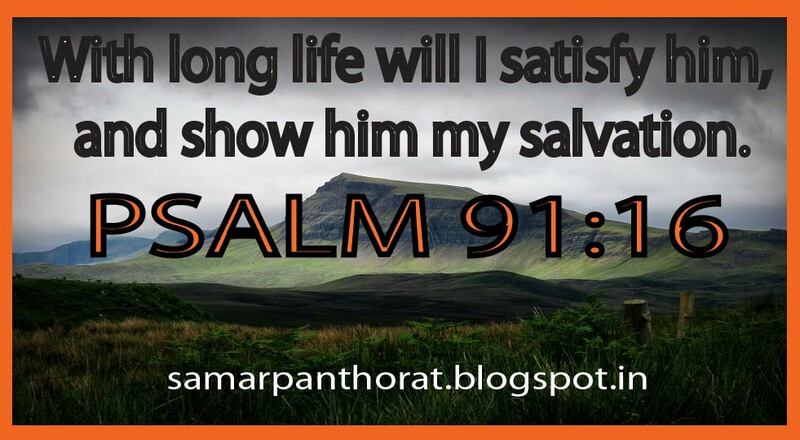 Psalm 91:16 - With long life will I satisfy him, and show him my salvation. My Lord has promised me that He will take care of me always. He will take care of my health. No disease and no weapons will prosper against me. No attack from the evil will work against me. No plans of the enemy will be accomplished because the Lord has blessed me with a Life of abundance. In Christ, there is abundant Life, Joy, and Peace. He wants to secure me always. He wants me to be with Him, dwelling with Him in the most high place. He wants me to be saved. He only shows me the path of righteousness. He only guides me on the narrow path that leads to His Kingdom. Dear Lord, thank you for blessing me with the Life of abundance. Thank you for giving me Joy and peace in my Life. Thank you for your gift of salvation. Thank you for saving my soul from my enemy and from eternal damnation. Lord please protect me and guide me in all the days of my Life, in Jesus Name I pray – Amen. Psalm 91:15 - He shall call upon me, and I will answer him: I will be with him in trouble; I will deliver him, and honor him. Whenever I call my Lord, He is always available for me. I have the phone number of my Lord. I don’t need to pay anything to call Him. My Lord has paid the price already on the cross. His phone lines are never busy. There is no network problem. There is no voice distraction, and there is an assurance that our conversation will always be confidential. Whenever I call Him, immediately He answers me. He loves to receive my call. He is always ready to talk with me. He becomes happy to answer my call. He loves to chat with me. I talk so many things and sometimes I talk frivolous things with Him, but patiently He listens to me. He never disconnects my phone, though my talk sometimes is of no use. It is me who always disconnects the phone first. Most of the time when I am in trouble I call him. He expects me call Him. But He never complains that I only call whenever I am in trouble. 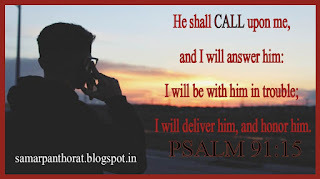 It is He, who reminds me always that He is with me in trouble and He only encourages me to call Him .As soon as I call Him without any delay He rescues me. When I come out of my trouble He honors me. When people hate, He honors, when people Judge, He honors, when people condemn, He honors, when people throw stones, He honors, when people try to pull me down, He honors, when people gossip about me, He honors, when people speak behind my back, He honors in front of everyone. When people plot against me, He honors. I am blessed that my honor comes from my Lord, who never lies. Who appreciates me so sincerely. Though I deserve nothing still it is His love and His Grace that He honors me. Dear Lord thank you for helping me in my times of trouble. Thank you for honoring me. Lord, all the days of my life I want to honor you and I want to call upon your name, in Jesus Name I pray – Amen. Psalm 91:14 - Because he has set his love upon me, therefore will I deliver him: I will set him on high, because he has known my name. Psalm91:14 - Because he has set his love upon me, therefore will I deliver him: I will set him on high, because he has known my name. I love my Lord. He has done so many things in my life. I am so blessed that the creator of this universe is my lover and He takes care of me. My spirit is rejoicing because of His unconditional agape love for me. My Lord delivers me from my enemy. When I am in the ditch, He takes me out and when I am in sin, He rescues me. When I am in trouble, He saves me. When I am disturbed, He gives me His peace. When I am alone, He comforts me. When no one is there to wipe away my tears, He is still there turning my teardrops into precious pearls. When no one cares, He cares. When everyone forgets, He remembers. When I feel guilty and ashamed, He gives me counsel. When I feel rejected, He opens His arms for me to be accepted. In the midst of a crowd, when I feel I am alone, he whispers in my ear and tells me not to worry. 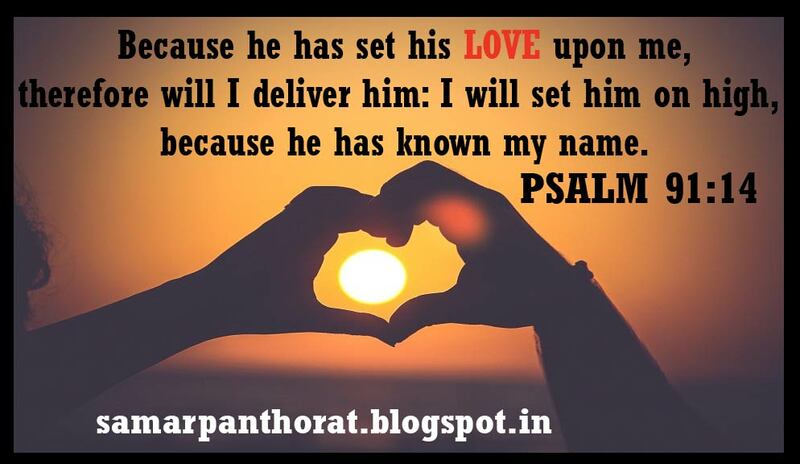 Whenever I feel Lord I am not worthy of your Love, He gives me more Grace to understand the depth of His love for me. He keeps on reminding me that I am worthy and precious in His sight, I am His beloved and He loves me more and more. When I am weak, the very next moment He gives me strength and makes me strong. When I am mourning He comes and holds my hand and says to me “Come sweetheart let’s dance”. He turns my mourning into dancing. When I feel I am cursed, He tells me your name is a Blessing. He is always ready to deliver me because I love Him and more than that He loves me. I know the name of my Lord and I respect His name. He sets me on high. When I fall at His feet, He lifts me up and seats me in the most high place. My enemies are still wondering how I managed to go up so high. There is only one secret I know the name of my Lord. The name above all names on the earth, above the earth and under the earth – JESUS. Dear Lord, I thank you for everything you have done in my life. Thank you for the Love and for the peace which you give to me. Thank you for making me understand the power of your name. Lord thank you for your Grace that I can pronounce your name and I can lift your name on high. Thank you for calling me you're beloved and I want to be your beloved always, in Jesus name I pray – Amen.